How to add a link into page turning book with Page Turning Pro for PDF? Q: I want to insert an image into page turning book with Page Turning Pro for PDF, and when some one clicks the image, it will be linked to my website. Could you please tell me how to realize this? A: Page Turning Pro for PDF is a professional program, it can not only convert any PDF documents to page turning book with ease, but also provides much practical functionalities, such as add video, image and link to page turning book. And it takes only a few steps to edit page. To insert an image with link to a website is very simple, you can just follow the steps as below. Step 1: Run Page Turning Pro for PDF and import the PDF needed. Step 2: Choose "Edit Pages" icon in primary screen to open the Flip Page Editor window. 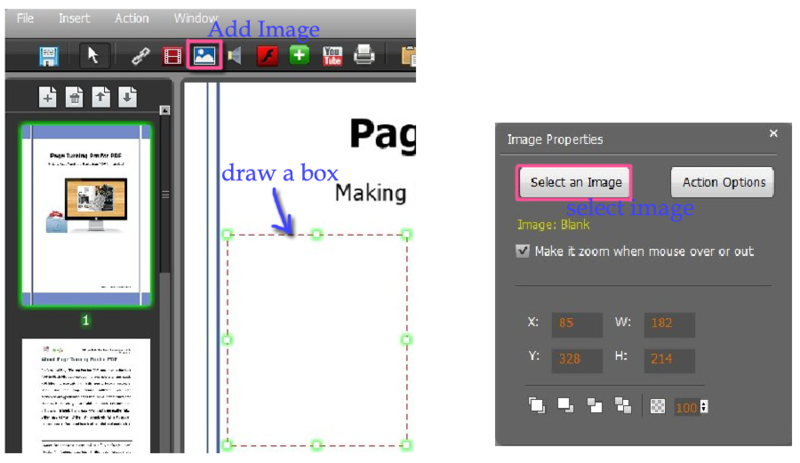 Step 3: Select "Add image" icon and draw a box on page for inserting image, then in Image Properties box click button "Select an Image" to select the image you want. Step 4: Select the inserted image ,and in Image Properties choose "Action Option" to open a dialog where can define the action. 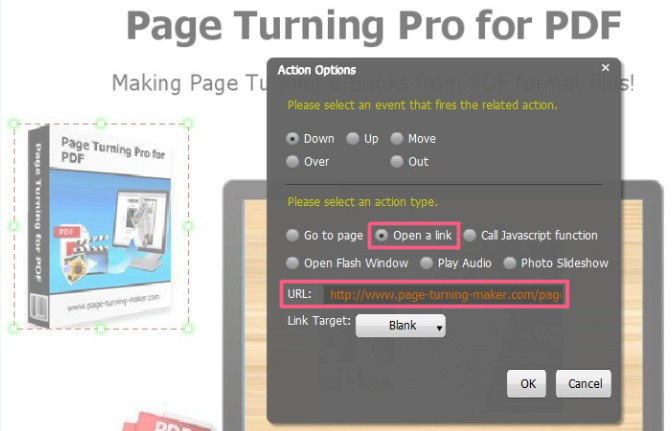 Within open dialog, select action type as open a link, and input the targeted link into the text box of URL option. Then click OK to confirm settings. Step 5: Save and exit Flip Page Editor.